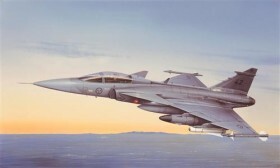 The Gripen is the standard fighter-bomber of the modern-day Swedish Air Force, where it came into service just a few years ago. Extremely manoeuvrable and compact, its sophisticated electronics provide it with all-weather, night-time flight capabilities. The aircraft can be fitted with an array of the latest air-air and air-surface weapons.